I must begin by thanking you for something that you did for me 17 years ago without even realizing it or knowing me. I sat glued to the television on November 6, 1995, watching your grandfather’s funeral. While I, an American Jew living in America at the time, disagreed with many of your grandfather’s policies, I really wanted to cry during that funeral. I wanted to cry over the fact that a Jew had killed another Jew. And you, Noa, made me cry. 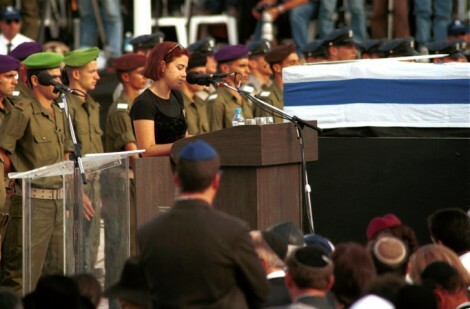 I teared up when you called your grandfather the “pillar of fire” for your family’s “camp,” and said that you felt like “the ground had been pulled out from under your feet” — because it made me realize that more than being leader of a nation, Yitzhak Rabin was the head of a family. It hit me hard. Prime ministers are replaced every few years. No one can replace a grandfather. When you described his soft hands and warm hugs, which were reserved just for the family, I began to cry because you captured the fact that despite being a seasoned warrior for his nation, he was still a typical Jewish grandfather who could not get enough of his grandchildren. Finally, when you directed your words to your grandfather and said, “I ask the angels of heaven who are escorting you to watch over you well because you deserve that,” I sobbed because I saw the pure innocence of a young granddaughter yearning to care for her grandfather. So, thank you. Thank you for making the story of Prime Minister Rabin’s assassination so human for me and for everyone. That focus on the human side of the story leads me to write to you today. I watched with horror when you were verbally accosted on Tuesday by Itamar Ben Gvir and Baruch Marzel following a ceremony in honor of your grandfather. What Itamar and Baruch have clearly forgotten — or perhaps have never learned — is that before putting on a kippa and tzitzit and performing other religious rituals every day, one must first and foremost be a human being. “Dereh eretz kadma l’Torah” — “upstanding interpersonal behavior comes before Torah.” Their behavior, just like the people responsible for assassinating your grandfather, did not conform to the most basic levels of human decency. Noa, I want you to know that you put on an exhibition today regarding how an outstanding human being handles conflict. 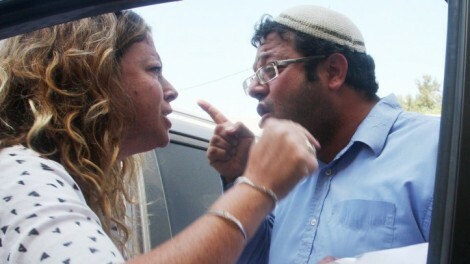 Itamar accosted you as you tried to drive away in your car, and you chose to engage this fanatic with grace. Then, when he demanded that you do soul searching over your grandfather’s policies, crossing all lines of human decency, you had no choice but to get out of the car and confront him. Most people, I fear, would have punched him. Had I been in your shoes, I might have had a hard time resisting the urge to deck Baruch Marzel for his taunts about money you have made since your grandfather’s death. Again, with such poise and dignity, you demanded that he apologize and ultimately re-entered your car and drove away. Our sages teach us about the remarkable character traits of our ancestral mothers — Sarah, Rebecca, Rachel, and Leah. Noa, you are most clearly one of their daughters. While you helped me cry the day of your grandfather’s funeral, no one has to help me cry today. I cry over the fact that people wearing kippot and tzitzit, articles that I wear with such pride, can act the way these extremists acted today and at other times. I cry over the fact that people who consider themselves religious Jews can behave the way they acted toward you, a fellow Jew. We can have disagreements and major differences of opinion, but we are all members of one nation. We are family and must respect and love one another despite our different perspectives. Noa, you deserve better. Just know that even among those who disagreed with your grandfather’s policies, most revere the fact that he dedicated his life to the Jewish people and mourn the fact that you were robbed of your grandfather for these past 17 years. May that awareness serve as some consolation for your grandfather’s murder, your terrible suffering since then, and for what was done to you today. Previous Previous post: When Did the Republican Party Become a America’s Fifth Column? Next Next post: Jewish Teens Lynch An Arab in Jerusalem: What Has Happened to Zionism?